Availability: James Squire Four Wives Pilsener is an Australian “craft beer” (the Malt Shovel Brewery that owns the James Squire brand is itself owned by Australasian food and beverage company Lion Nathan, which is owned by Japanese company Kirin). 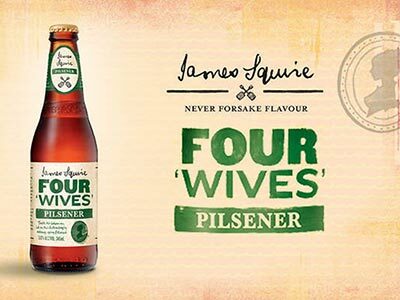 At the time of writing, James Squire Four Wives Pilsener is only available on tap in New Zealand. Who is James Squire? James Squire (1754-1822) is an English convict who was transported to Australia. He’s often credited with being the first person to successfully cultivate hops in Australia and founded the country’s first commercial brewery in 1798. Beer blurb: According to the advertising material available, James Squire Four Wives Pilsener is true to the classic European pilsner style, with crisp, clean bitterness and grassy, citrusy hop aromas and flavour. Tastes like: After-work drinks on a Wednesday or Thursday evening – you’re feeling good because the working week is almost over, but you’d rather it was a Friday. Even better, you wish you were on holiday somewhere exotic. Is it the best beer ever? That’s a round-about way of saying that James Squire Four Wives Pilsener is good, just not great. This Aussie pilsener is deep golden in colour, with a grassy hop aroma. The flavour is well-balanced between the florally sweetness of the hops and the bitterness of the malt. That makes it rather refreshing and sessionable on a hot day, but also rather middle-of-the-road in terms of taste. Four Wives isn’t as hoppy as I’ve come to prefer my craft beer pilsners, nor is it as faithful to the classic European-style pilsener as purists would prefer it. That leaves it somewhere in the middle – good, not bad, but not great either. What else should I drink? If you’re at the pub and James Squire Four Wives Pilsener is the only thing on tap, then by all means order yourself a pint. But if there’s an Emerson’s Pilsener, which is a Kiwi craft beer that’s also now owned by the same parent company, then I reckon that’s a better choice. Before you accuse me of being an overly patriotic, I also think the pilsner by Little Creatures Brewing in Australia – yet another craft brewery bought out by Lion and Kirin – is also superior to Four Wives Pilsener.